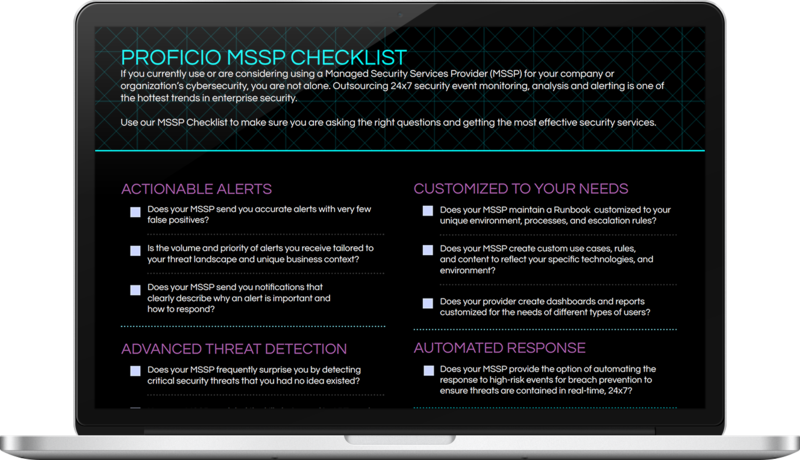 Use our MSSP Checklist to make sure you are asking the right questions. Proficio’s vulnerability management services enable organizations to proactively protect their data and IT assets without the cost of software or hardware, or hiring additional in-house security experts. We conduct the service using a cloud-based suite of IT security and compliance services including vulnerability scanning, asset tagging, web application scanning and policy compliance management. Vulnerability data from a variety of vulnerability scanning tools is integrated with Proficio’s Security Operations Center as a Service to more accurately prioritize alerts based on known vulnerabilities.